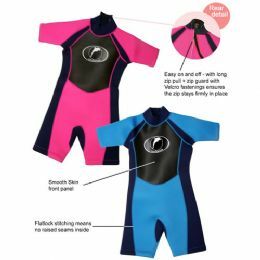 These fantastically engineered Konfidence kids shorty wetsuits are made to the same specification as adult wetsuits, so your budding young surfers or body boarders will feel part of the scene. You'll have peace of mind too as not only do these westuits for kids offer protection from chilly winds and cooler waters, but the neoprene fabric provides 100% UV protection. These Konfidence kids shorty wet suits feature a bright designs lets you keep an eye on the kids as they ride the waves. The Konfidence Shorty Wetsuits for children are made from top quality neoprene that helps to keep children warm in the water. The flatlock stitching eliminates ridges and ensures a comfortable fit. Konfidence Wetsuits have been designed specifically to fit children. The vibrant colors offer great styling and make children easy to see. Konfidence kids shorty wetsuits help kids stay warmer in the water for longer. Offer protection from chilly winds and cooler waters. Konfidence shorty wet suits feature a bright designs lets you keep an eye on the kids. Flatlock stitching eliminates ridges and ensures a comfortable fit.